Macarons are THE most fashionable cookies at the moment. but I prefer the one from Pierre Hermé ,they are like a little bite of heaven. Thats why i would suggest first to make a course! I found in New York DANA’S BAKERY where the Chef Dana Loia propose classes how to make Macarons. 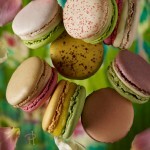 I love the idea making them myself, because it is a very creative process to invent your favorite macaron. French Macarons are a slightly crisp and chewy confection made with egg whites, confectioners sugar, granulated sugar, almond flour and food coloring. 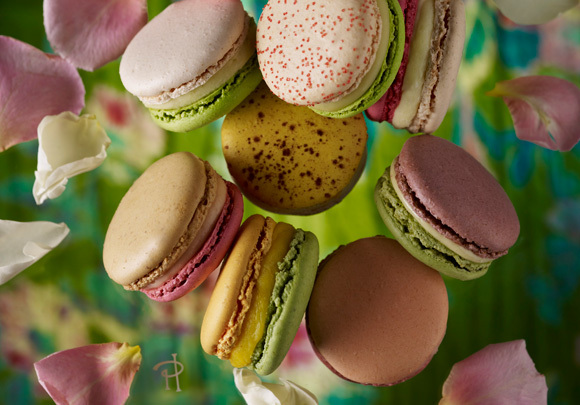 Macarons are filled with ganache made of white chocolate, buttercreams or simply fruit preserves. Its name is derived from the Italian word maccarone or maccherone. According to Wikipedia, “the history of the French Macaron has been predominantly a French confection, there has been much debate about its origins. Larousse Gastronomique cites the macaron as being created in 1791 in a convent near Cormery. Some have traced its French debut back to the arrival of Catherine de’ Medici’s Italian pastry chefs whom she brought with her in 1533 upon marrying Henry II of France. 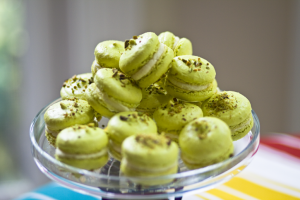 For my Pistachio French Macarons, I used Pierre Herme’s recipe. I posted the basic macaron shell recipe here, and color with your blend of green and yellow. Pierre suggests adding the coloring to the first batch of aged / liquified egg whites, then add to the almond flour and sugar. Continue with the rest of the macaron shell recipe. I choose to decorate my shells by chopping pistachio nuts and sprinkled onto the shells before baking. Delicious filling; be warned – you’ll be tempted to eat much of the filling! Chop up the chocolate and melt it in a bowl over a pan of barely simmering water. Bring the cream to a boil with the pasticho paste. Stir to blend and then pour it over the chocolate – a third – at a time. Blend for 10 minutes with a hand blender. Pour the ganache into a gratin dish. Press with plastic wrap over the surface of the ganache and set in the refrigerator for the ganache to thicken. Spoon the ganache into a piping bag with a plain nozzle. Pipe a generous mound of ganache onto half of the shells then top with the remaining shells. Store the macarons in the refrigerator for 24 hours and bring them back out 2 hours before serving. Preheat oven to 350º F (180º C). Line two baking sheets with parchment paper and have a pastry bag with a plain tip (about 1/2-inch, 2 cm) ready. Grind together the powdered sugar with the almond powder and cocoa so there are no lumps; use a blender or food processor since almond meal that you buy isn’t quite fine enough. In the bowl of a standing electric mixer, beat the egg whites until they begin to rise and hold their shape. While whipping, beat in the granulated sugar until very stiff and firm, about 2 minutes. Carefully fold the dry ingredients, in two batches, into the beaten egg whites with a flexible rubber spatula. When the mixture is just smooth and there are no streaks of egg white, stop folding and scrape the batter into the pastry bag (standing the bag in a tall glass helps if you’re alone). Pipe the batter on the parchment-lined baking sheets in 1-inch (3 cm) circles (about 1 tablespoon each of batter), evenly spaced one-inch (3 cm) apart. Rap the baking sheet a few times firmly on the counter top to flatten the macarons, then bake them for 15-18 minutes. Let cool completely then remove from baking sheet. Cut the prunes into quarters and pour boiling water over them. Cover and let stand until the prunes are soft. Drain. Squeeze most of the excess water from prunes and pass through a food mill or food processor. Heat the cream in a small saucepan with the corn syrup. When the cream just begins to boil at the edges, remove from heat and add the chopped chocolate. Let sit one minute, then stir until smooth. Stir in the pieces of butter. Let cool completely before using. I also tend to overfill them so you may or may not use all the filling. Let them stand at least one day before serving, to meld the flavors. Store in an airtight container for up to 5 days, or freeze. 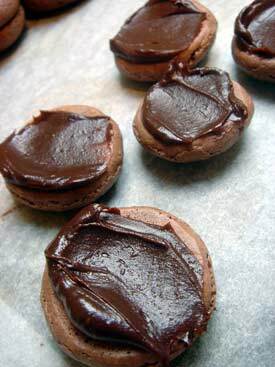 If you freeze them, defrost them in the unopened container, to avoid condensation which will make the macarons soggy.